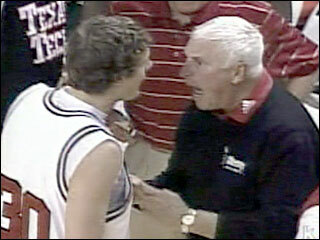 Bobby Knight Was My Catcher « It's a Kind of a Family. It's a Kind of Insanity. Last night I was interviewed on a local cable TV show called The Boston Baseball Heads Show. We talked a little bit about Red Sox Nation, but what I enjoyed most was reminiscing about my years pitching in Boston’s Yawkey Amateur Baseball League, during the 1990s. The host of the show, Dave McKay, is the president of the league and a former manager of one of the teams I used to pitch against, McKay Club. One of my favorite memories is of our catcher, Greg, and the things he said to me during our pitcher’s mound conferences. 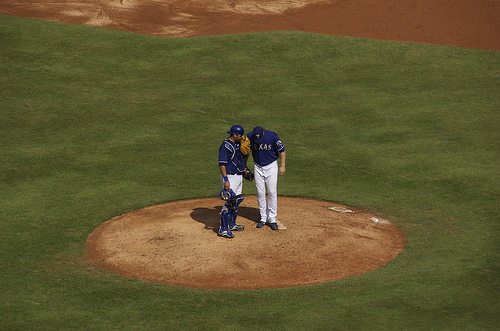 He only called time-out for these meetings when I’d mis-read one of his signals and throw the "wrong" pitch, or when I’d hit a batter on an 0-2 count, or when I’d walk a couple of batters in a row, or when I’d start talking back to players who tried to "rattle" me with trash talk. Greg would walk out to me slowly, and I’d start smiling, bracing myself for the next chapter in an almost comical pitcher-catcher relationship. Now Greg was one of the older guys on the team. I was perhaps 25, and he was perhaps 38 (which was ancient to me). A little overweight, creaky knees, graying beard, balding. He’d played on lots of teams during his lifetime and somehow he’d hooked on with us. He’d lost some zip on his throws and his mighty swing wasn’t fluid anymore, but you could tell that he used to be great. Every now and then, he’d hit a home run that would make everyone’s jaw drop. And he’d just trot around the bases, expressionless, then walk back to the bench and start putting on his equipment, already focused on the next inning. He seemed to play baseball with a silent, personal vengeance. When he arrived at the mound for a conference, Greg would remove his catcher’s mask and, in a very calm (but intense) voice, curse me out with all the venom of Bobby Knight. I’m sure everyone observing us had no idea of the thrashing I was receiving, partly because I had the expression of a person trying to hold back laughter. Greg was about a foot shorter than I, and he never looked me in the eye during his epic tirades. He either looked at my chest or let his eyes wander the field while every four-letter word ever invented spewed forth. At the end of his speeches, he DID look me in the eye and say something encouraging, like, "See this glove? Just throw to it." or, "Next pitch, fastball inside, and we’re out of this inning." Funny thing is, I actually found Greg’s berating to be inspiring. Somehow, I knew that he respected me as a pitcher, had extremely high expectations for my performance, and really enjoyed catching me. I knew that his rude remarks were motivated by a deep passion for winning, and it felt awesome to have a teammate who was so driven. When he’d walk deliberately back to home plate, put his mask and glove back on, and crouch behind the batter, I knew that I’d execute perfectly my next pitch and that the batter was doomed. Greg faded away from our team in the mid-’90s and I haven’t seen him since then. But when I was inducted into the Yawkey League Hall of Fame in 2003, he wrote me a nice email congratulating me on the honor. Of course, it was one of the most meaningful notes of congratulations that I received at that time. Although we had never been friends, we had collaborated intensely for a few years as "the battery" for those Avi Nelson Club teams, two totally different personalities sharing a passion for baseball and a deep desire to win. Lovely memoir, Rob. I really enjoyed reading it. It’s nice to know I’ve met a real hall-of-famer, too! Hope you’re doing well. I have almost finished writing my song about my early days in following the Red Sox. I’ll send it to you when it’s done.